1) Science is to study the physical environment through observation. 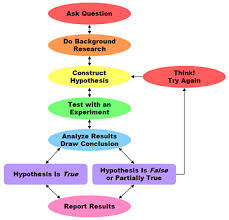 2) The Scientific Method: First we have to come up with a question. After we come up with a question, we can do research about what we want to find and therefore come up with a hypothesis. Next we can start the experiment and than collect the results and analyze it. From the results, we can conclude our findings and compare it with our hypothesis.